Some days you just need a good snack! If the thought of dragging out mixing bowls and casserole dishes makes you want to run screaming out of your kitchen (we’ve all been there), never fear. The mug is here! With a few simple ingredients and a microwave, your cup can transform into a one-dish wonder. Not only are these mug recipes super delicious, but most of them can be ready in five minutes or less. (Perfect for those late night cravings when cold pizza or popcorn just won’t hit the spot.) Ditch the plates and whip up one of these quick mug recipes faster than it takes you to order in Chinese. Your wallet and your taste buds will thank me. Today we’ve rounded up 10 of our favourites all up in one easy to find place. Enjoy! Here are 10 mug recipes we think will hit the spot. Tell us: What’s been hanging out in your mug lately? (Besides your morning coffee, of course!) Let us know in the comments below! I am going to give the omelet a try. What a great way to have a fast easy tasty breakfast. Heck this winter I am sure I will be giving the Peach Cobbler a try. I’ll have to try some of these. The banana one sounds awesome. Perfect for chilly winter mornings. My go to breakfast meal is an omelet and I am really excited to try this because I would only be dirtying one dish instead of 3 or more. I will have to make the french toast one for my husband. I really want to try them all! OMGoodness these all look so amazing I don’t think I could pick just one to try. I love that you can go from savory to sweet all in a mug! Great round up for sure. Thanks so much for sharing! Oh my gosh! These are fun ideas – and great recipes. Of course I had to take the time to look and save a few. Thank you. I’ll have to try the french toast mug recipe tomorrow and also the omelette one really soon – Easy and quick! I have a mug and a microwave and I generally can find five minutes to make a snack. I’m not a big fan of cooking, but these recipes all look delicious and healthy as well. I’m going to bookmark this post as it will come in handy when I have a house full of company soon. This is so new. First time I saw one of these was on Facebook and someone made a cake. I was hooked ever since and knew I had to try one soon. All these mug pie recipes make me interested and excited to try to create them, too. We have not tried making any of them. The Blueberry muffin with streusel topping mug cake and the coffee cup quiche are on top of my list. 🙂 I hope to get them right. I love making treats in the microwave to eat. It’s just me and my husband in the house so it saves us on so much waste or also making to much sweet food. These are all amazing recipes to try out, the breakfast cookie sounds amazing. These look SO good. I have several mug recipes saved but have never made any. I really should whip up a cake for myself sometimes. I’ve heard of mug meals before but never realised there were so many recipe out there!! I don’t own a microwave but I can see how someone who is super busy and stressed could really find these helpful to take the pressure off! Nice !! I love using my mug to make easy and delicious recipes! 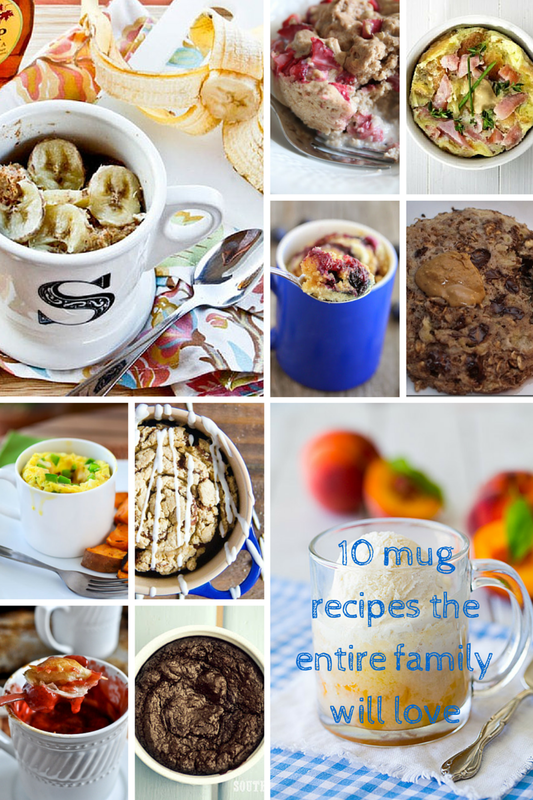 Thanks for compiling this list of fabulous mug recipe ideas! I’ve never made an omelet inside a mug but I’d love to try that one for sure. That would come in really handy during busy mornings! Heather, These recipes are GREAT! My son is in college and is always looking for quick meals for one. I passed the link on to him so he’s got more to cook. I might buy some of the ingredients to fill his stocking this Christmas — Santa can be practical, too, right? Wow, I love this. I had no idea that you could make so many recipes in a mug! I need to make some of these! The healthy brownie for one is my fave. A treat that indulges but you don’t feel guilty about? Mm hmm, count me in. Those all sound awesome! 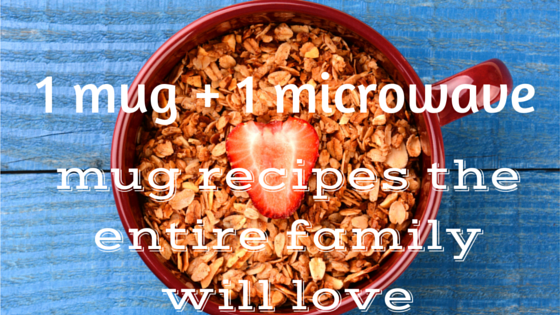 I had no idea you could make so much with just a mug in the microwave! This is perfect timing that I’m reading this becasue I’ve been searching all over for one mug recipes! These are excellent and I can wait to try them, especially the Peanut Butter, Banana, and Chocolate Chip Breakfast Cookie… Yum! The only thing on this list I have made is the mug omelette. These are some great ideas! I’d love to try a few mug desserts. A peach cobbler mug cake would be so good right now. This is such a great list! I’m always eager to try mug recipes, but haven’t actually done it yet. Now I’ve got a great list to try all in one spot! Pinned for later! Anything that makes life easier and is yummy sounds like a plan to me – you are very creative. I have been simplifying my life with recipes like this! K.I.S.S, right? I think these mug recipes are such a good idea!! Holy cow! I never knew you could make some many things in a mug! I’ve only made eggs! Awesome! These are great recipes. I really have never thought about using my mug to bake! Um, I am pretty sure I NEED that Peanut Butter, Banana, and Chocolate Chip Breakfast Cookie!!! It sounds awesome.